Lifetime 26 inch Personal Table? 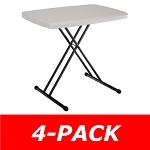 - Features a 26" x 18" molded tabletop (white granite) with a round folding frame (gray). It has three height settings (24", 26", and 28"). 2-year limited warranty. Individually packaged. Lifetime 26 inch Personal Tables? 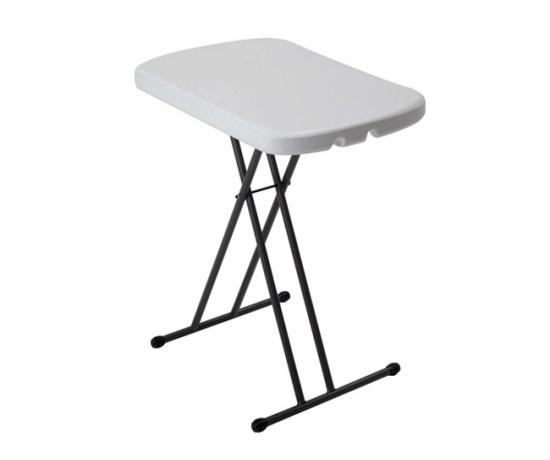 are constructed of high-density polyethylene and designed for strength and stability. The tables feature three adjustable height settings from 24" to 28" for versatile use. 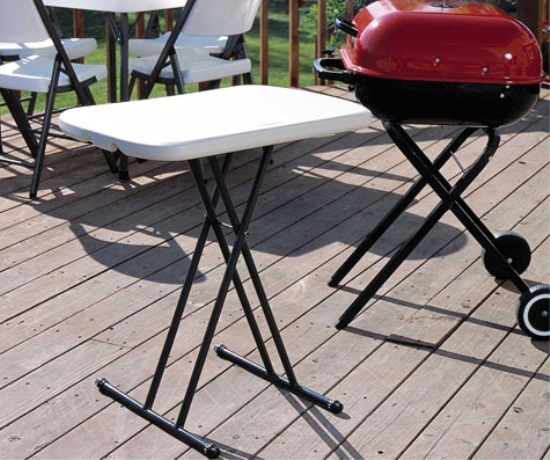 The steel frame design folds flat for easy storage and is protected with a powder-coated, weather-resistant finish. The tables are built for indoor or outdoor use.? Top Three Adjustable Height Settings Adjusts to 24" (61 cm), 26" (66 cm), and 28" (71 cm)? Lightweight Design Designed for Strength and Stability Stain Resistant and Easy to Clean? Dimensions (Open): 26" L x 17.9" W x 24" - 28" H (65,9 cm L x 45,6 cm W x 60,9 cm - 71,1 cm H)? Dimensions (Closed): 40.4" L x 17.9" W x 1.8" H (102,7 cm L x 45,6 cm W x 4,8 cm H)? 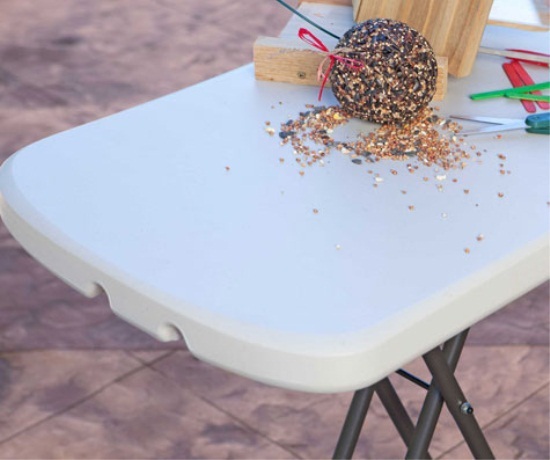 Table Top Material: High-Density Polyethylene (HDPE)? Table Top Thickness: 1.4" (38 mm)? Leg Tubing Diameter: 0.7" (19 mm) Weight: 8.6 lbs. (3,9 kg)? Top Color: White Granite Frame? Adjustable Height: Tables adjust to multiple heights for added convenience.? Impact Resistant Corners: Engineered for superior durability and strength.? Durable Polyethylene Surface: Lightweight, durable, stain resistant surface contains UV inhibitors for added protection from weathering.? Broad Leg Stance: Creates superior stability.? Non-Marring Foot Caps: Frame is powder coated and caps prevent floor damage.? Great... Very strong and easy to store or set up. Had a model from another manufacturer which cracked. These are very strong and large enough to handle my needs. Strong durable folding table. It is very light weight and folds up nicely. very durable, well constructed from a very reputable company! This adjustable table was such a hit that we got another one. We use it for an Xbox stand, food, toys, as a desk and we love it. It's really light and easy to adjust. I have used several different lifetime tables for 10 years and they are amazing. Thank you Lifetime ! Q: What is the dimension of the top of the table? A: It is 26 inches wide by 18 inches deep. Q: How wide and tall are the bars? Q: How high is the table? Q: How does your price matching work? A: Just give us a call, we verify the price, and we match it or beat it. It's quite simple. Q: Can one person adjust this or do I need a 2nd person? A: One person can easily adjust it without assistance. 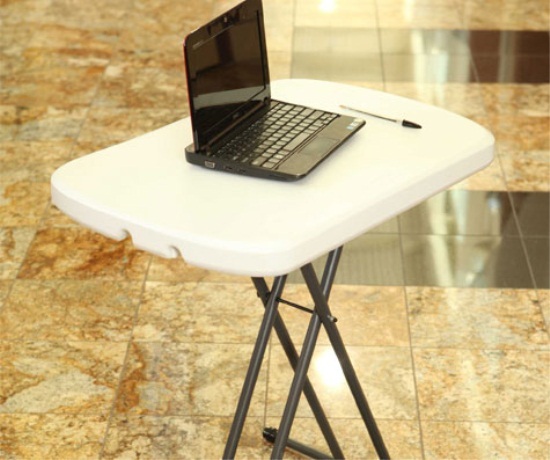 Fast Shipping: Orders for the 80251 Personal Adjustable Table generally leave the warehouse the next business day. Dimensions: 45" x 18" x 2"